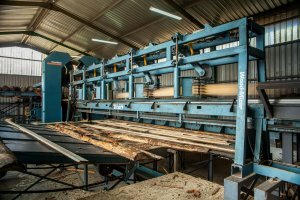 Good day to all sawmillers, it's now the end of October, so we're well and truly in the home stretch for 2016. I'm sure you will all agree that 2016 has certainly been a better year for us sawmillers and we hope that this translates into a more “festive” season for you all. But before we get into all that, we still have a little business to attend to. Please don’t forget that starting on Monday the 14th November in Limpopo will be the SSA “Information Sessions”. 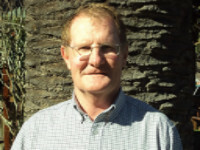 These will continue through the week and we will be accompanied by Dr Peter Stohr who will be making a presentation on the financial benefits of diligent kiln management at a sawmill. Dr Stohr will be backed up by the usual culprits Roy Southey and Mandy Allpass. These session will be aimed at sawmill management but should also appeal to financial managers, so we hope as many of you as possible will attend. All are welcome and it's certainly not only for SSA members, so please feel free to invite your neighbors. The past month also saw the holding of the SASDEA annual conference. This annual gathering of sawdoctors saw a near record attendance of 47 sawdoctors and people associated with the sector. This was most encouraging and especially as Mrs Dianne Randal was present to explain to the delegates the good news that sawdoctoring will soon be receiving the recognition it deserves in that it will be registered as a bona fide trade in SA. All this thanks to the sterling work being done by the FP&M Seta and SSA. News form the market place is that structural lumber is moving well and that mills are happy with the state of affairs, so lets keep pushing and remember to keep cutting straight and drying flat. Cants processed via a Wood-Mizer TITAN T-MR160 circular multirip. Wood-Mizer Holdings’ acquisition of Multisaw’s wideband sawmill equipment range, now known as Wood-Mizer TITAN, underscores how this development will allow current and future customers to unlock even further value from the Wood-Mizer TITAN range. 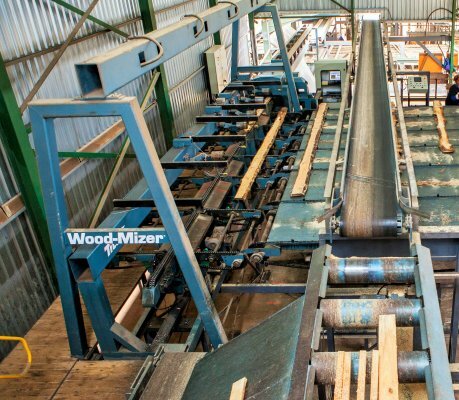 The 2015 commissioning of a Wood-Mizer Titan wideband sawmilling line at integrated wattle extract, sugar and timber business grouping UCL (Pty) Ltd’s Glenside-based Midlands Pine Products sawmill, is bang on target with the initial and future objectives that UCL set for the mill. How the mill has performed to date and going forward is tallied below. 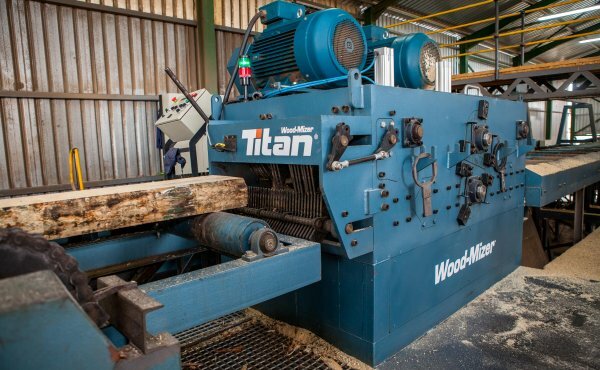 Following Wood-Mizer’s recent acquisition of Multisaw’s wideband sawmill equipment range that will now be known as Wood-Mizer TITAN, current and future Wood-Mizer TITAN customers can expect a range of additional benefits to kick into gear that are set to unlock even further value from the already proven range. The synergies from Wood-Mizer and Multisaw’s combined know-how in the narrow and wide band saw arenas, will result in a new generation of sawmilling solutions that is set to revolutionise the global sawmilling industry. Plans are also far advanced to offer TITAN wideband products and services to Wood-Mizer’s global customer base through the company’s international network of representatives. This will give Wood-Mizer TITAN owners the assurance of Wood-Mizer approved customer service and after sale support. After-sales service support including radically up-scaled spare part inventories and new supply and technical support team networks in existing and emerging markets are set to decrease downtime and ramp up productivity. Timeframes for commissioning new installations, the maintenance of existing lines together with the technical training of mill personnel will also benefit from the added capacity that is now available globally. This in tandem with the proven performance of the Wood-Mizer TITAN range as detailed below, provides compelling reason for partnering with Wood-Mizer going forward. Feed speed and output delivered by the latest wideband sawmilling technology that can supply and exceed the sawmills current and future sawn timber throughput requirement without exceeding budget, was the basic requirement that UCL had when it initiated the upgrade at its Midlands Pine Products sawn timber production site. The phased upgrade that started end-2015, is expected to be completed by early 2017. 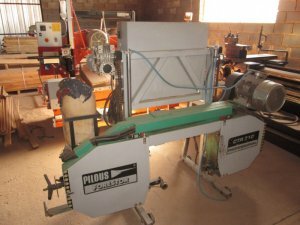 Stage one which went live in late 2015 saw a complete Multisaw wideband sawmilling line slotting into place with several new and customised features. The new line in tandem with Midlands’ existing frame saw lines will give the mill the projected throughput numbers that it aimed for once Stage Two is also operational. Stage 2 which is already far advanced will see the installation and commissioning of an additional Wood-Mizer TITAN T-AE optimising edger on the frame saw end of the mill that will replace a manual edging operation. Throughput and recovery, which is already at a high level, is set to increase significantly with the addition of the additional optimising edger on the frame saw line. The already commissioned Multisaw line includes primary and secondary breakdown phases with material transfer and waste systems linking the line together and transferring the end-spec material to the green chain and the waste to chipping. 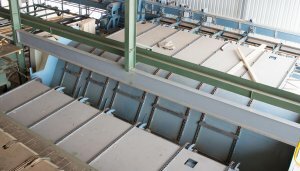 The sawn timber production process starts with debarked logs that are accurately loaded and placed and then orientated into the final cutting position by the heavy duty automated log infeed and outfeed systems that forms part of the Wood-Mizer TITAN T6-TBLT Twin Vertical 6 inch (152 mm) wideband primary breakdown unit that produces equal open face cants. 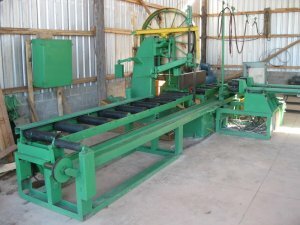 The 60m/min, high capacity and robustly constructed 6 inch, 2 x 45 kW twin achieves equal open face cutting using a fast and accurate log loading system coupled with pressurised hold-down rollers and a spiky chain feed system in tandem with servo-enabled size adjustment systems that allows for on-the-fly size changes. The outfeed end of the 6 inch twin includes a new cant positioning and sideboard removal system. Pressurised side rollers on either side of the cant accurately position and guides the cant out of the twin and also allows for controlled sideboard discharge. The cant that exists the unit is now transferred down the line to a Wood-Mizer TITAN T-MR160 double arbor, circular multirip. An automatic discharge unit kicks the cant onto a face-up position before it enters the multirip. The heavily constructed and powerful 2 x 75 kW motor multirip is capable of making multiple high tolerance cuts in a single pass. 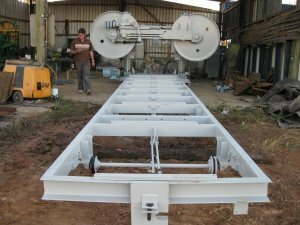 The multirip at Midlands was customised up from 45 to 75 kW to accommodate a larger range of log diameters and cant sizes that can readily adjust to varying log supplies. Board without wane exiting the multirip are transferred to the green chain with sideboards from the 6 inch twin and multirip staged for secondary breakdown. Midlands’ secondary breakdown unit comes in the shape of Wood-Mizer TITAN T6-R/TR Twin Head 6 inch, 2 x 45 kW wideband resaw. The 6 inch twin offers ultra-fast size changes through a servo enabled head lift size change system. Again a new feature, the servo control ensures accurate and quick size changes that require as little as 0.3 seconds to change size for each sideboard passing through. This results in optimal recovery that unlocks extra product and reduces waste. The new head lift system also preserves blade life with the blade now focussing on cutting instead of also changing the cutting height. The twin head configuration also makes it possible to make two cuts into each sideboard with only one pass. The optimising edger uses optical scanning technology to achieve high precision and low waste edging of boards. The automated edging process is automated and starts with an initial scan and analysis of the wane board profile entering the unit to determine which cut width will unlock optimal recovery. Cut decisions are based on volume recovery and product value. The board is then aligned and fed through the unit. Feed speed through the unit is pinned at 140 m/min. 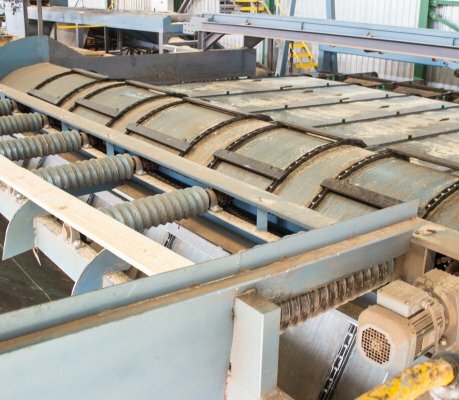 UCL (Pty) Limited’s objective with the refurbishment was to deliver a mill that uses the latest wide band sawmilling technology to achieve maximum feed speed and throughput capacity together with optimal recovery with capacity to increase this into the future. The phased project is well on track to deliver on this objective with the recent agreement between Wood-Mizer and Multisaw now adding further momentum to this process. 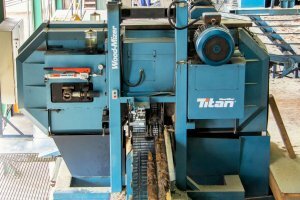 Sideboards pass through a Wood-Mizer TITAN T6-R/TR Twin Head 6 Inch (152 mm) wideband resaw. The Wood-Mizer TITAN T6-TBLT Twin Vertical 6 Inch (152 mm) wideband primary breakdown unit at Midlands Pine Products. 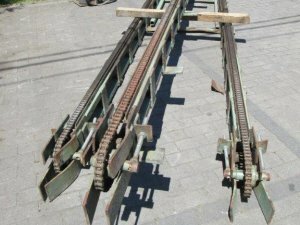 Wane boards from the resaw transferred down and across via an unscrambler to a Wood-Mizer TITAN T-AE automated optimising edger. The entire edging process is automated with an initial scan of the wane board entering the unit determining which cut width will produce optimal recovery. edger on the frame saw side of Midlands Pine Products mill. Furniture that destroys forests: crackdown on 'rampant' trade in rosewood. Below are some of our latest listings..
Johnnie’s mom tells him to phone his dad and ask him when he will he be back from playing golf. Daddy arrives at home and mommy gives him a helse snotklap around the head. Mommy tells Johnnie: "Come and tell Daddy EXACTLY what that woman said when you phoned him!"